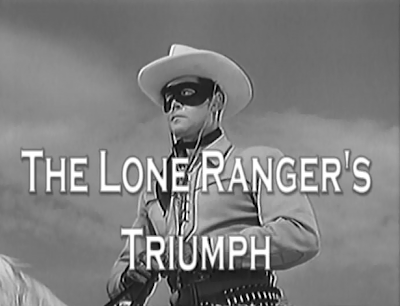 John Kenneth Muir's Reflections on Cult Movies and Classic TV: From the Archive: The Lone Ranger: "The Lone Ranger's Triumph"
From the Archive: The Lone Ranger: "The Lone Ranger's Triumph"
In “The Lone Ranger’s Triumph,” the opening arc of the series comes to a climax. Meanwhile, Tonto (Jay Silverheels) attempts to get help from the police deputies at Colby, only be treated in disrespectful, bigoted fashion. The deputies, In fact, are working with Cavendish and have been planted in Taylor’s department. 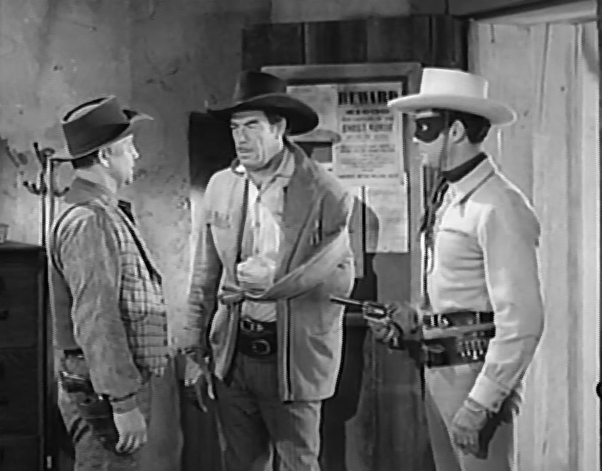 The Lone Ranger (Clayton Moore) and Tonto join up one more, and begin taking down Cavendish’s installed stooges in Colby. 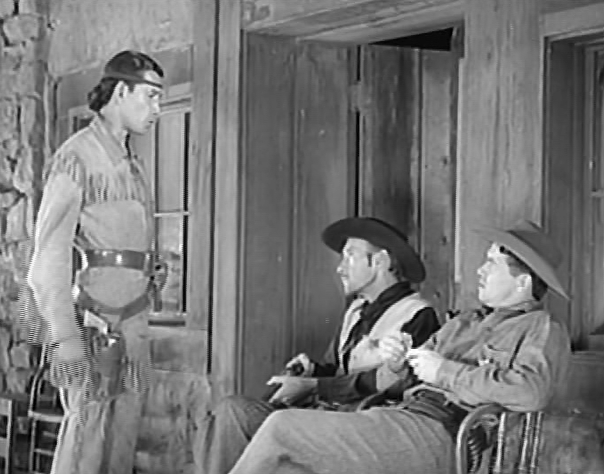 They have the time to do this because Cavendish overheard some disinformation from the Lone Ranger, namely that the U.S. Cavalry was nearby, and was going to be recruited to stop the outlaw. 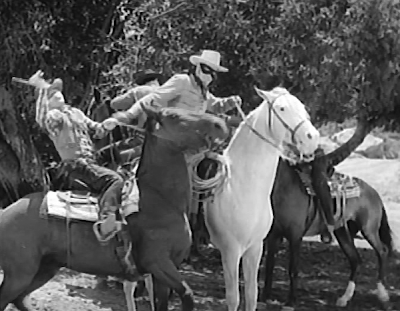 As Cavendish prepares for the cavalry, literally, the Lone Ranger and Tonto re-take Colby. Taking down one villain at a time, the Lone Ranger and Tonto capture the town jail, and then proceed to stop the bad guys in their tracks. Finally, after a long and intense chase, the Lone Ranger captures Cavendish and delivers him to the city jail. Although the episode title “(The Lone Ranger’s Triumph”) effectively gives away the narrative outcome, this is nonetheless a satisfactory resolution to the Cavendish arc. The final chase scene does not disappoint, and it’s a pleasure to see a hero dispatching a villain without resorting to murder. Here, Cavendish ends up in jail, pending trial. Without belaboring the issue, it strikes me as especially important that The Lone Ranger does not count himself above the law, or feel that it his personal right to exact revenge. He doesn’t mishandle Cavendish, or otherwise abuse him. He does only what the law requires and permits…he brings a criminal to justice. Once upon a time, this outcome was a given in our American entertainments, but somehow in recent years we have become afraid that by giving “bad guys” like terrorists a trial, we are somehow “weak.” On the contrary, submitting villains to trial and justice is a real sign of strength. It shows that we believe in the rule of law, and that our principles are not mere things we talk about but representative of our actions. In terms of the Lone Ranger mythos, all the final pieces fall into place here. Once captured, Cavendish asks a variation of the famous line: “who was that masked man?” as the Lone Ranger and Tonto ride off into the sunset, bound for more adventures. Perhaps of more genuine interest, at least by today’s standards, is the discriminatory way that Tonto is treated by virtually every Colby official he encounters. “The redskin’s getting a little ornery,” one deputy notes dismissively, and it’s impossible not to parse the phrase in anything other than racist terms. What’s great about The Lone Ranger, however, is that this ugly talk comes from a certified bad guy, and thus equates racism and bigotry with the behavior of outlaws and other men of disrepute. I must admit, I didn’t realize that programs as early as 1949 had taken this viewpoint regarding race in America, but it’s rewarding to see Tonto treated as true blue, while his dismissive enemies are, rightly, treated as ignorant thugs. Late in this episode, Tonto proves his worth again, leading the cavalry into battle against Cavendish. It's something that our society has apparently forgotten -- it's harder to be the good guy than to be the bad guy, and that using the bad guy's methods make the good guy no different than the bad guy. Bad guys don't follow rules, good guys do. This does mean that good guys have to be much better than bad guys. I'd still prefer it.